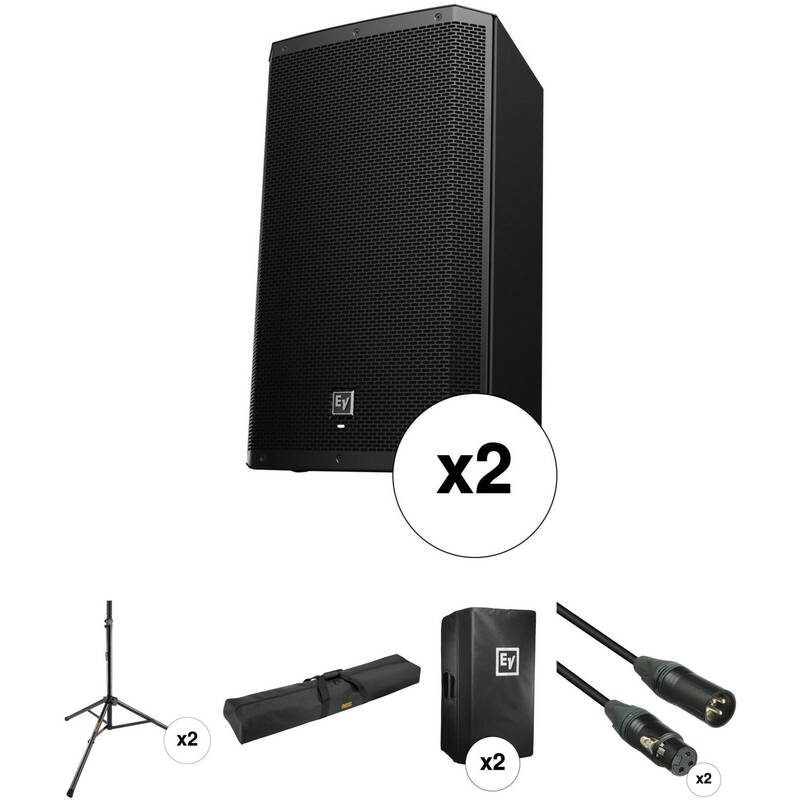 Speaker Type | Driver Size: Active | 15"
Active | 12" Active | 15" Passive | 12"
The Electro-Voice ZLX15P Dual 15" Speakers with Stands, Covers, and Cables Kit from B&H includes two full-range Electro-Voice 2-way powered loudspeakers, two Auray SS-4420 steel speaker stands, two Electro-Voice ZLX-15 CVR padded speaker covers, two Kopul Premium Performance XLR microphone cables, and a Gator Cases GPA-50 speaker stand bag. It can be used for sound reinforcement applications such as live stage, theater, rehearsals, and more. Each speaker is rated at 1000 W RMS each and has input level meters and independent amplifier controls to ensure optimal gain structure. The Auray steel speaker stand features a telescoping center column with five height adjustments ranging from 46 to 76", and can support speakers weighing up to 100 pounds. The B&H kits padded speaker cover has polypropylene binding and is lined with fleece to protect the 15" speakers during transport and storage. Finally, two XLR cables and a single speaker stand bag complete the B&H kit, and provide everything needed for audio-event and venue applications. The black Electro Voice ZLX-15P-US 15" Two-Way Powered Loudspeaker is a compact and versatile loudspeaker featuring custom-engineered drivers in a rugged enclosure. The loudspeaker features a grille made of 18-gauge steel with a black powder-coat finish. The loudspeaker matches the specially developed drivers with a custom-built Class-D amplifier module and powerful DSP. Whether pole-mounted or used as a floor monitor, the loudspeaker delivers powerful sonic impact and intelligibility. Note: This system should be suspended with certified rigging hardware by an authorized rigging professional and in compliance with local, state, and federal overhead-suspension ordinances. Store, transport, and protect your ZLX-15 Two-Way Passive Loudspeaker from dirt, dust and scratches with the black ZLX-15-CVR Padded Cover from Electro Voice. The cover is made of polypropylene with fleece lining and has a black hook and loop fastener. Users will appreciate the handle access openings, exterior slip-in accessory pocket, and white embroidered EV logo on the front. The Speaker Stand Bag from Auray is a spacious, durable bag designed to hold and protect two speaker stands, six microphone stands, or miscellaneous hardware for DJs, bands, and engineers between gigs, parties, and special events. The 52” rugged nylon bag holds stands up to 51” in length. The smooth, coated interior won’t mar the finish of your stands. Dual large-gauge zippers provide easy and fast access to the bag’s contents. Webbed nylon handles with a padded touch-fastener wrap make carrying the bag, even with one hand, simple and balanced. The Auray logo is embroidered on the front and provides quick, stylish bag identification. The heavy-duty nylon exterior resists rips and tears, and protects speaker stands from scuffs and scratches. The smooth, coated interior keeps your stands' finishes looking nice. The bag holds one or two speaker stands, six microphone stands, or miscellaneous hardware up to 51" in length. Dual large-gauge zippers allow you to open and close the bag easily on either side or the middle. Nylon extensions on the zippers make them even easier to grab. The Auray logo is embroidered on the front, providing easy bag identification. Forget carrying one speaker stand in each hand. Put your stands in the bag, then carry the bag with one hand, thanks to the webbed nylon carry handles and padded handle wrap. Box Dimensions (LxWxH) 29.0 x 19.0 x 19.0"
Box Dimensions (LxWxH) 27.0 x 18.7 x 1.9"
Box Dimensions (LxWxH) 16.6 x 10.8 x 2.2"
EV ZLX15P Dual 15" Speakers with Stands, Covers, and Cables Kit is rated 5.0 out of 5 by 1.